20- 12"x15" Die Cut Handle Bags For sizes up to 8x10. 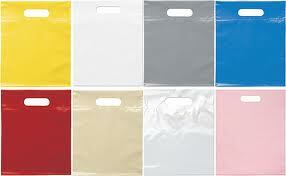 Attractive high gloss, low density 1.5 mil plastic bags with reinforced cut-out handle for easy carrying. Useable dimension=12"x12". Larger sizes , and other colors available in cases of 500 by special order.